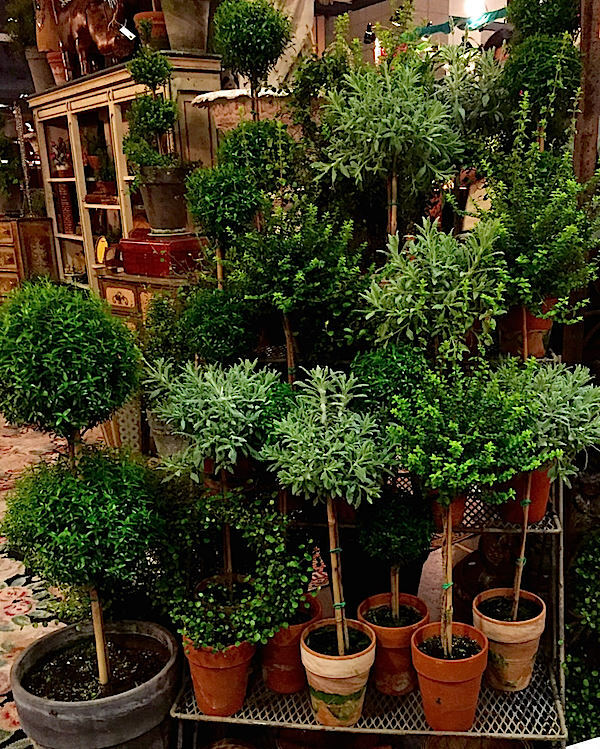 The Antiques & Garden Show of Nashville is a much anticipated event of the season. 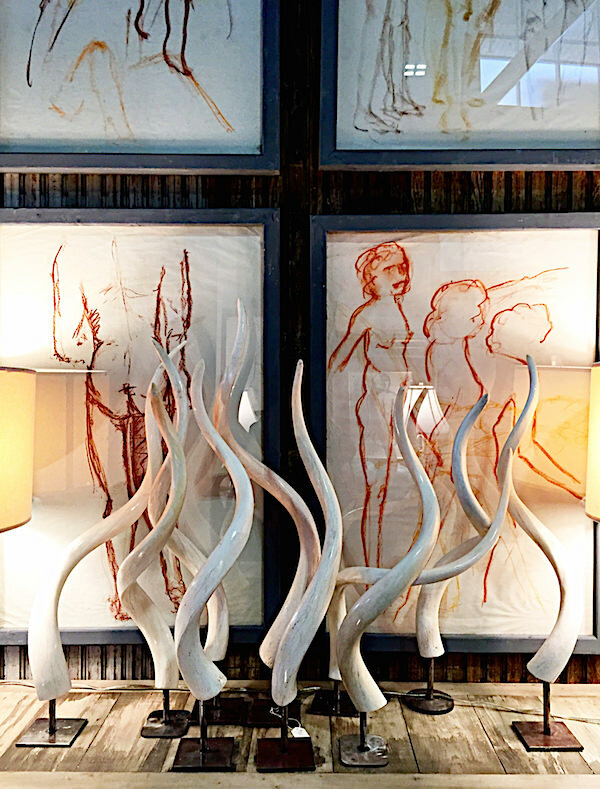 A highlight of not only Nashville but antique, garden and design aficionados across the country, the show features over 150 dealers from far and wide as well as between 10,000 and 15,000 visitors. 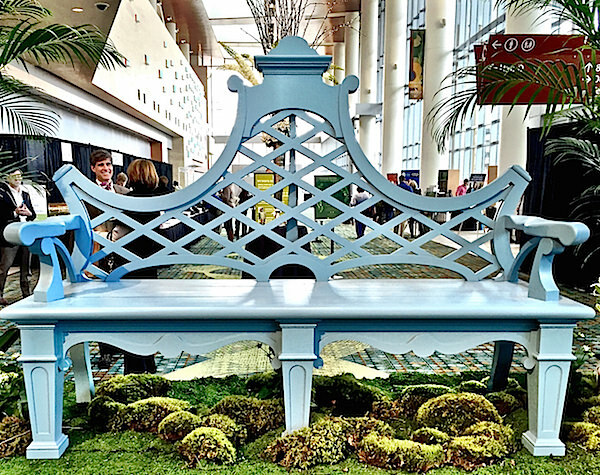 Vintage Millworks set the tone with their Chatsworth inspired bench. I was honored to be a part of the illustrious lecture series that is overseen by both the Antique Show and a national advisory committee of prestigious names in design. 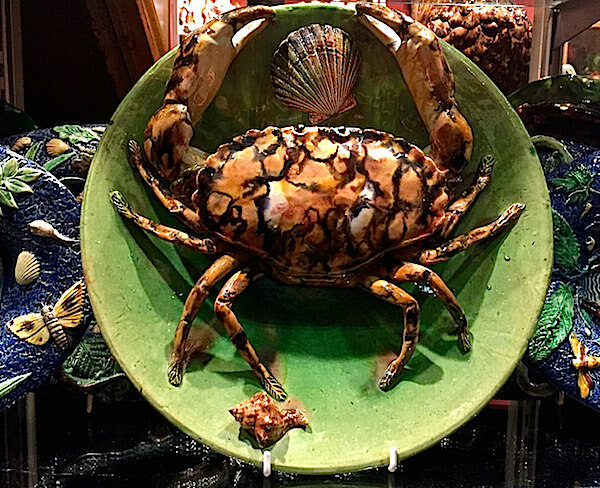 With a huge range of antiques, art, and horticultural offerings, I thought I would share a few of my favorites. 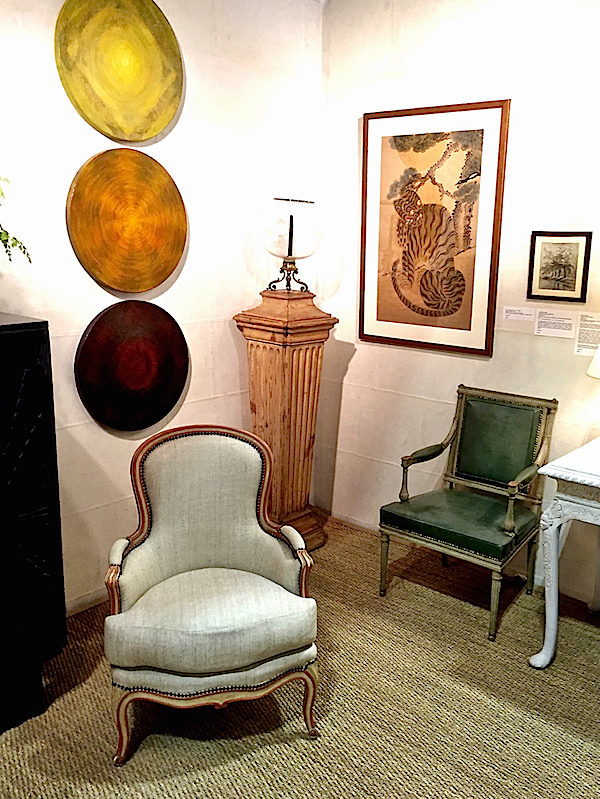 James Sansum always has the most unusual combination of furniture, art and decorative accessories. 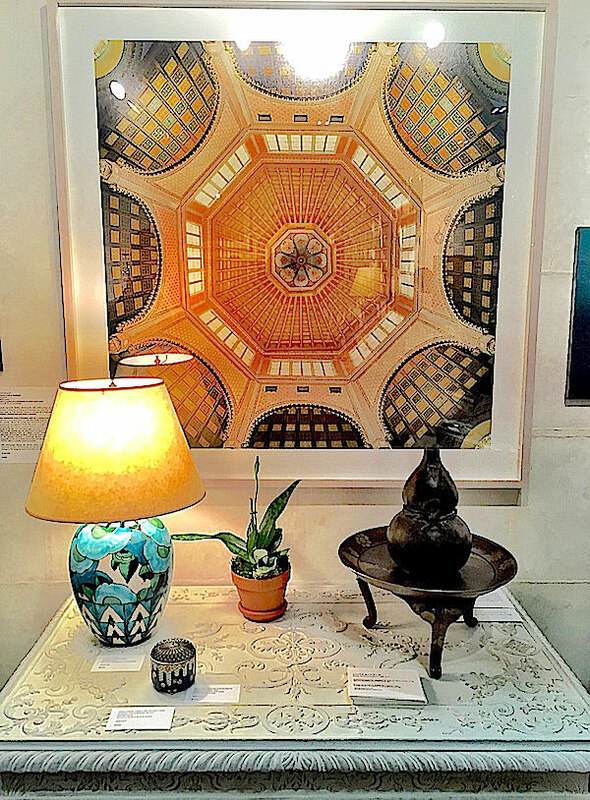 Displayed with a sophisticated sensitivity, it is more a poetic expression of beautiful objects, rather than merely a booth with merchandise to sell. Here the inspiring interplay of geography, style and eras articulates the art of the mix. 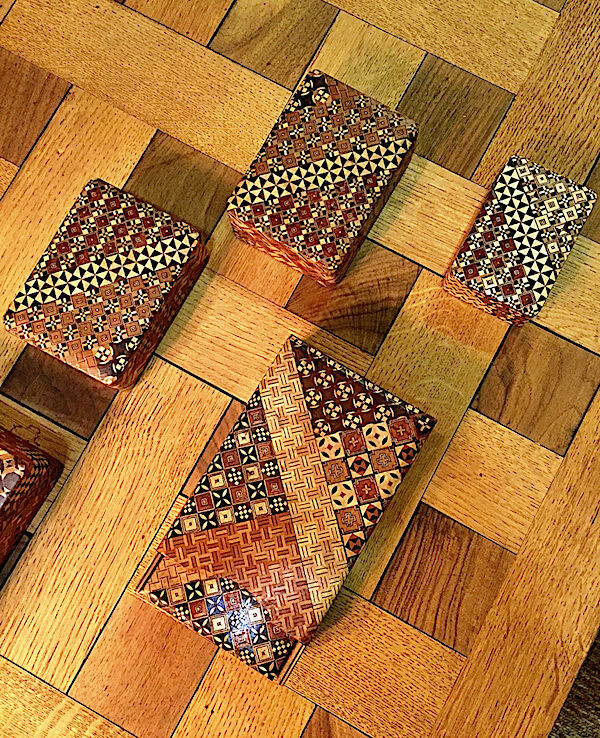 Above an artisanal mix of old and new and below a thoughtful display of Yosegi Zaiku inlay boxes from circa 1930. This complex parquetry of intricate geometric patterns made from exotic indigenous woods represents a traditional technique prized by both the Japanese and foreign visitors. 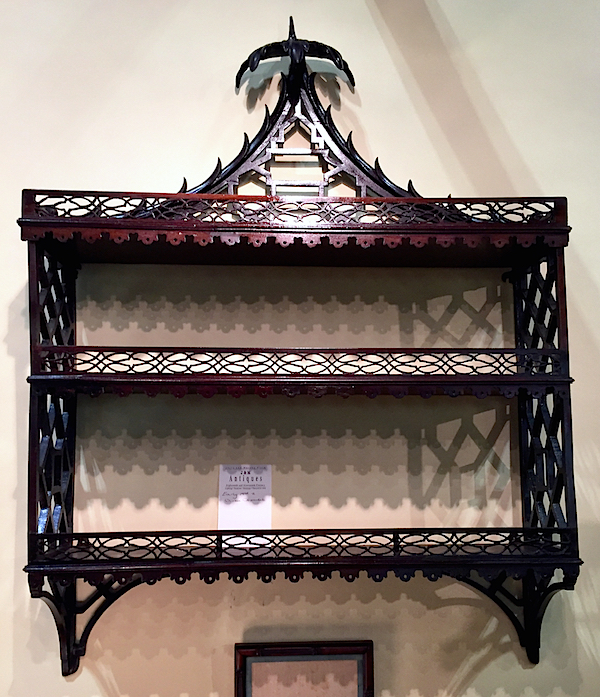 Another favorite booth was that of Jayne Thompson Antiques with contributions from Sycamore, Connie Beale’s shop in Danville, KY. A residential-like display, anchored by a handsome breakfront/bookcase, included the fine collection from this well respected gallery. 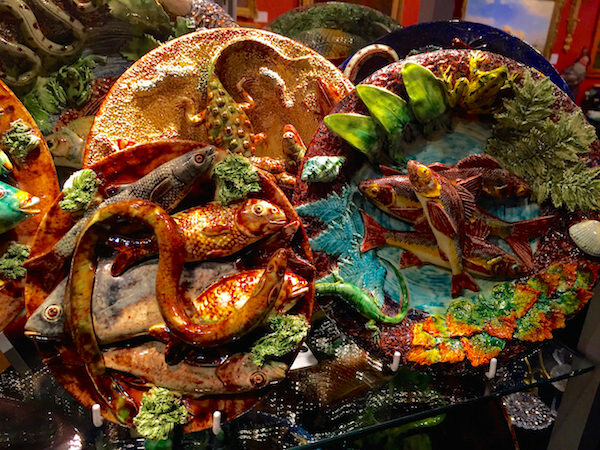 Palissy ware, named after the French 16th century potter, Bernard Palissy, refers to the mostly Portuguese-made revival of this form of three-dimensional ceramics. Featuring plants and primarily sea creatures, these pieces, from 1850 – about 1920, are vivid and incredibly sculptural. Dealer Jesse Davis had one of the most impressive collections I’ve seen. More vintage inspiration from nature was seen at the Barley Twist booth with this charmingc. 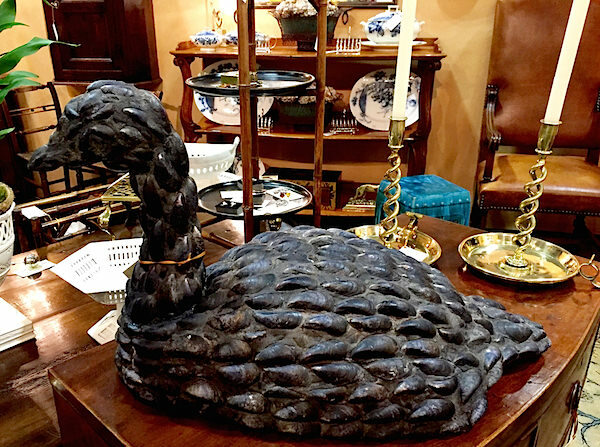 1900 English folk art goose made of mussel shells on plaster and papier mache. 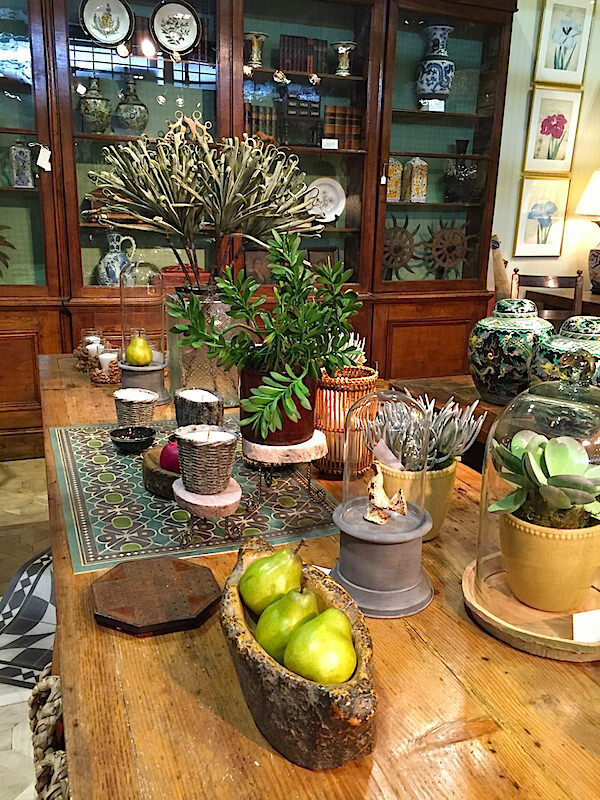 Along with antiques and art, Acanthus Studios specializes in exotic accessories inspired by nature. 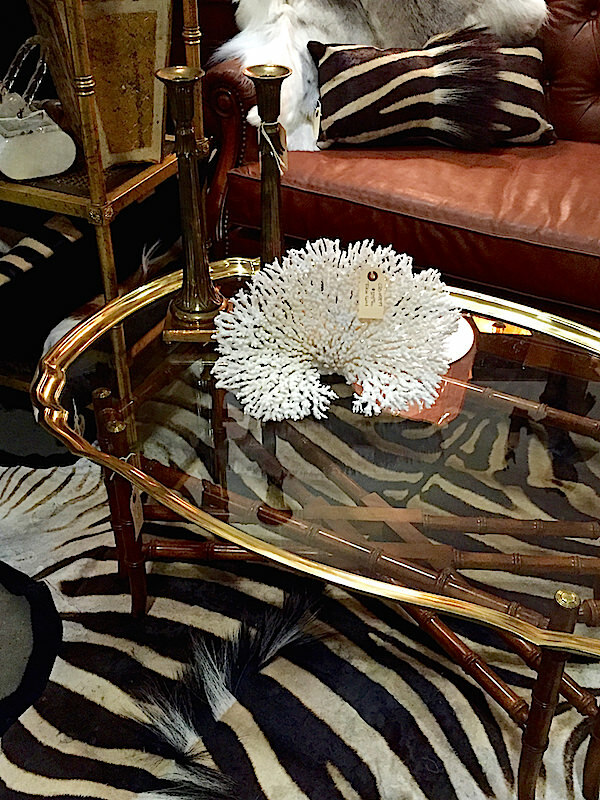 Those looking for African furnishings such as zebra skin rugs, hide pillows and coral fixtures will find a treasure trove to select from at this Atlanta shop. 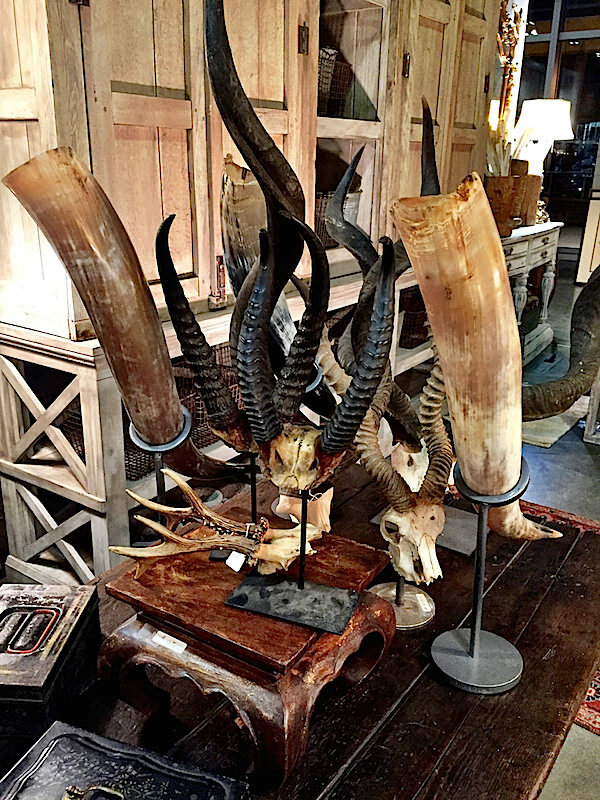 Elephant Walk also had a wide range of both traditional and exotic offerings including antiques and reproductions. 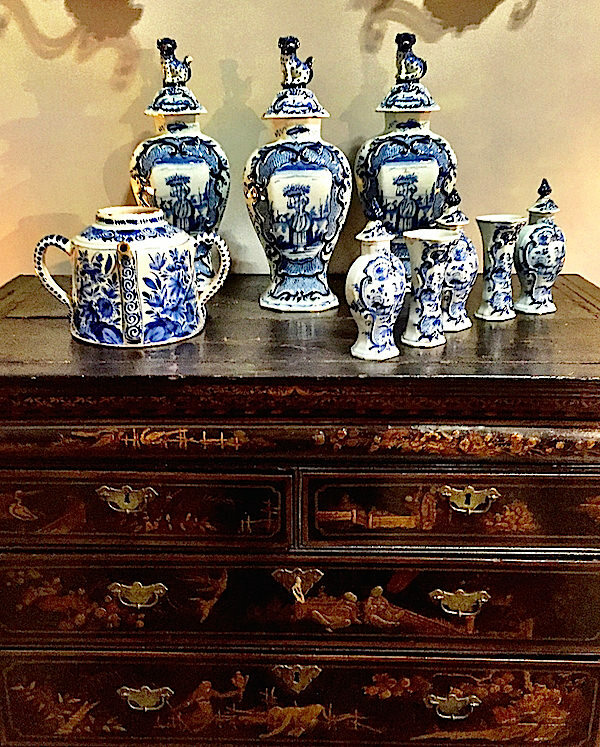 A very pretty pairing was seen at Caroline Faison Antiques where a collection of Delft porcelain sat on an English Japanned highboy from c. 1800. This delicate early 19th century Chinese Chippendale hanging wall shelf from J&M Antiques is a timeless jewel. With beautiful and unusually detailed fretwork, the elegant umbrella like top is all hand carved. And of course among the antiques and art was a plethora of plants and garden accessories. This arrangements of topiaries was take-home worthy. 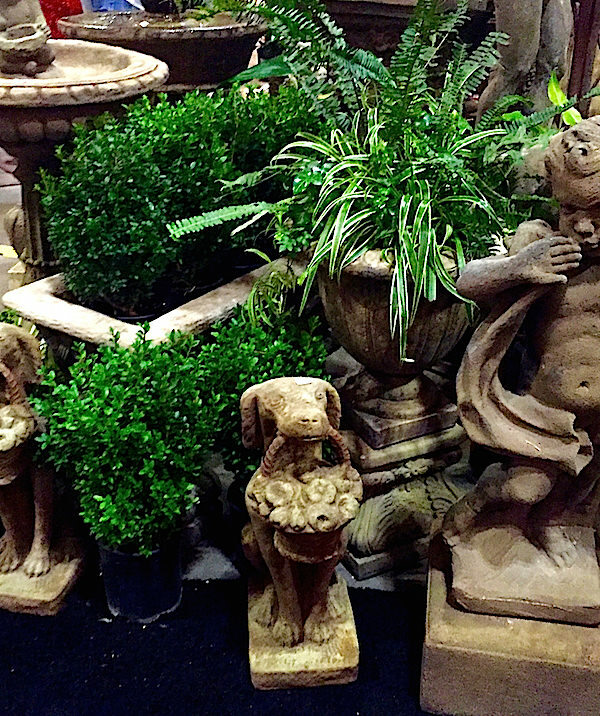 Planters and statuary was in abundance and while I returned to sub-zero temperatures, the Antiques & Garden show gave us all a glimmer of hope for spring. This entry posted in art, furniture, garden, interior design, travel. Entry Tags: antiques, Antiques & Garden Show of Nashville, Nashville, Travel Bookmark the permalink. So inspiring to see the show through your eyes! That Vintage Millworks bench is wonderful! Love the peek int the Antique and Garden Show. Thanks so much for filling my head with pretty things. I am in love with everything vintage. Thank you for photos. Did you buy anything? 79 queries in 0.659 seconds.